You can say I had a writer's block for a week. Firstly, I had no topic on mind, and secondly, I was too occupied to think of any. But finally, here I am; back with a topic. I'm sure you must have interned or worked while still pursuing a course. If you're like me, for whom getting good grades is important, then handling two things simultaneously can be a task. I'm witnessing this difficult situation, and I think I might just have a solution. We have a test on this Saturday and the portion is as vast as a final exam's. Our professor announced this test on last Saturday, which means, there's just a week's time to prepare. All of us have different lives, and the amount of free time we get varies too. Therefore, I'm gonna list down few probable time-slots in which you can study. In the end, the main motive will be studying (or reading) as much as possible. 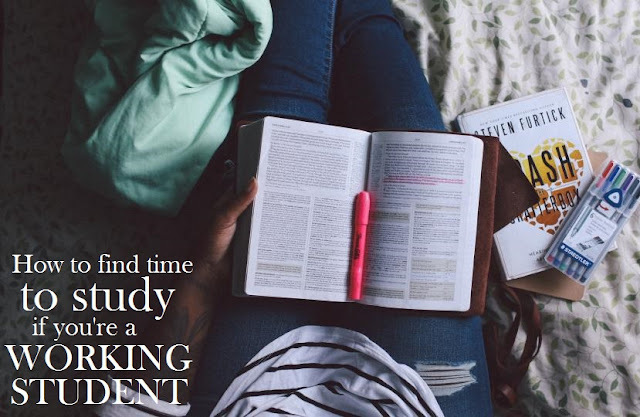 If you're someone who travels for more than 30 minutes to get to a place, then this can be a good time for you to study. I have been studying in train since the last two days and I've read around 100 slides out of 500 or so. I study on my cell and if ever a topic is beyond my understanding, I write it down in OneNote. And then, when I would sit for revising, I would ask my classmates and get those doubts cleared. So far, this method is working for me. Some days, you have less amount of work. Instead of wasting it by socializing or being on social media, just open whatever study material has been given, and study! If ever your boss sees you doing this, he or she will be impressed. Plus, why to waste your time, when you can utilize it for studying? If you live in your office's vicinity, then you can wake up at 6:00 instead of 9:00 and study. Morning can be a peaceful time to study. Use this tranquility to your advantage, and open those books! If you reach home by 8:00 pm, instead of wasting time, study. Have your food, rest for 15 minutes, and then finish all the assigned portion for the day. How do you make time to study?